Triggers/Content Advisory: Very mild sexual innuendo, violence, and some graphic, emotional scenes that might be disturbing. In this third book in Marissa Meyer's bestselling Lunar Chronicles series, Cinder and Captain Thorne are fugitives on the run, now with Scarlet and Wolf in tow. Together, they're plotting to overthrow Queen Levana and prevent her army from invading Earth. Their best hope lies with Cress, a girl trapped on a satellite since childhood who's only ever had her netscreens as company. All that screen time has made Cress an excellent hacker. Unfortunately, she's being forced to work for Queen Levana, and she's just received orders to track down Cinder and her handsome accomplice. When a daring rescue of Cress goes awry, the group is splintered. Cress finally has her freedom, but it comes at a higher price than she'd ever expected. Meanwhile, Queen Levana will let nothing prevent her marriage to Emperor Kai, especially the cyborg mechanic. Cress, Scarlet, and Cinder may not have signed up to save the world, but they may be the only hope the world has. Warning: This is a largely incoherent, fangirlish, totally unprofessional review. This series warrants squealing, crying, insane amounts of love, and not logical thought. WHERE DO I START??? HOW DO I RESIST TYPING THIS WHOLE REVIEW IN CAPITALS??? Basically, this book brought out the fangirl in me. And I mean seriously; I was giggling, giddy, squealing, wanting to cry and scream and laugh with one second intervals, and from the first chapter I was feeling all the feelings. I think the wonderful thing about this series is that it's escapism, pure and simple. You never want the story to end and yet you also need it to go faster. It's so easy to lose yourself in the world and the characters. It's so sad and so beautiful at the same time. The writing's just as amazing as always. The dialogue is flawless, the world-building incredible, and every scene is vivid and flawlessly constructed. There's also a spectacular amount of action and a number of THRILLING fight scenes that are just as emotionally poignant as they are epic fights. The plot is also effortlessly tight and intelligent, and there's never a dull moment. It's gripping. The only thing about the writing - or rather the plot - that I don't love so much, are the scenes not involving Cress, Thorne, Scarlet or Wolf. It's entirely personal preference, but I just found the scenes with Cinder and Jacin, for example, and the scenes with Kai and his advisors, etc, a bit boring. Those characters aren't my favourites, so I guess that's an explanation, but still - I found myself rushing over those parts a bit. The characters are all preciousness and babies that must be kept safe and loved for all eternity. Everyone is extremely vivid, three dimensional, consistent, and gorgeously different from one another. Meyer has written everyone so well that it's clear from the first chapter that she's simply following them and letting them lead the story themselves. It's insanely brilliant. There are also some new characters - Jacin, for example - and more page time for recurring characters, such as Sybil and Dr. Erland. I really enjoyed the added depth these characters got, and how Meyer brings them into bigger roles in the story's central conflict. Like the original cast, these characters are effortlessly compelling and dynamic. The romances are absolute perfection. Wolf and Scarlet are my favourite couple, but Cress and Thorne come a close second. I adore that everyone's relationships are so different from each other's - how they range from Cress and Thorne's dorky, sweet awkwardness to Wolf and Scarlet's subtle adoration and fierce protectiveness. Every couple is immensely shippable, and I love how healthy, strong, and downright swoony these relationships all are. As for Cinder and Kai, I'm glad they got those special scenes together at the end of the book. To be honest, I don't like Kai as much as I once did, but he is bearable when he's with Cinder. Otherwise I find him very annoying. But there aren't just amazing romances. The friendships are spectacular too. I love Cinder and Thorne's relationship, and even Wolf and Cress's interactions and Erland and Thorne's towards the end are incredible. The chemistry between every single person is so rich and natural, and the way their different personalities clash and compliment is without comparison. It's mind-blowingly perfect. 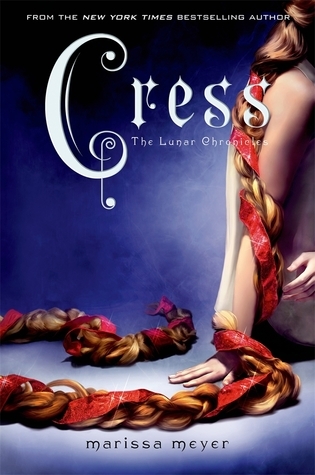 Cress is another addictive installment in a series that keeps getting better. It's quite possibly the best escapism and the best example of storytelling done right that I've ever had the privilege of losing myself in. My only disappointment is that I DON'T HAVE A COPY OF WINTER AND I'M CURRENTLY DYING OF NEED. Ahhh I need it more than ever now!! I really need to start reading this series - I've only heard good things :) Super happy to hear you loved it! You really do, it's amazing :) Thanks! Yay, I love that you loved this so much! I love that the author created such distinct characters - they really each have their own unique personalities! Admit it, you just want me to start reading this series ASAP! Well, since I've been curious about it for a veeeery long time, I might actually grant you that wish :P SO happy you LOVED it! Lol ;) But you really need to, it's AMAZING!